How long do we kayak each day? Can I have a private tent? Is a double kayak available? Can I bring my own paddle, PFD or kayak? How experienced is your guide? Will your kayaks fit me? Can I just rent your kayaks? Why is Butterfly Tours more expensive? Why is your website so comprehensive? Where can I read reviews from previous guests? Will you cater to my special dietary requirements? Why does Butterfly Tours focus on the southern tip of Gwaii Haanas? How much time is allowed for exploring the ancient Haida village? What's the difference between your wilderness kayak journeys? When should I arrive in Sandspit? What is the best way to travel to Sandspit? What can I do before and after the kayak trip? Where can I store items in Sandspit while I am on the kayak trip? What time does the trip arrive back in Sandspit on the last day? When should I depart Sandspit after the trip? When is a trip likely to become sold out? Can you hold my space without a deposit? How can I learn more about the "Butterfly way"? How are these companies related? You are welcome to contact Gord if you have additional questions. The weather on Haida Gwaii is changeable and usually not accurately predictable more than a day or two in advance. July and August generally provide the best chance for decent kayaking and camping weather. We offer a wide variety of tours and expeditions for paddlers with different levels of kayaking experience. Many of our tours are suitable for relatively inexperienced kayakers. Alternatively, our more advanced expeditions are designed specifically for kayakers who have accumulated some experience and developed reasonable boat-handling abilities. Ultimately, openness to learning combined with a flexible, positive attitude can be far more important than a person's previous kayaking experience. View our kayak skills demonstration video. We generally paddle up to five hours in a day, taking occasional rest stops on shore to stretch our legs. We typically do more kayaking on calm days and less on windy days. If it becomes too windy, we remain on shore. These kayaking experiences are designed for participants who are reasonably able-bodied. Dependable reflexes, as well as practical levels of balance, fitness and coordination are necessary, yet there is no need for our guests to be accomplished athletes. Cruising speed is the most efficient speed for a vessel to travel. To conserve energy, we prefer to maintain optimum cruising speed while kayaking. Yes, we provide enough tents so that each person can sleep in their own private shelter if they wish. We have no specific age limit; however, many of our trips are not likely suitable for pre-teen children. Families with pre-teens would probably have a better experience by arranging a custom tour designed specifically for their group. The Kayak Guesthouse Vacation can be tailored to suit family groups; please contact Gord for details. A Seaward Southwind double kayak is available in Rose Harbour; however, we do not provide a paddling partner for the double. (We provide each person with the opportunity to paddle a single kayak.) If you would prefer paddling the double, please be sure to arrive with a paddling partner. Bringing your own paddle and/or PFD (personal flotation device) is fine, provided the PFD is Transport Canada approved and not inflatable. Bringing your own kayak could involve additional costs. Butterfly Tours owner & guide, Gord Pincock, has kayak toured through Haida Gwaii every summer since 1981. He is the most experienced sea kayak guide in Gwaii Haanas National Park. Our fleet of fibreglass Seaward Tyee kayaks can comfortably fit a wide range of people; Tyees are relatively spacious single kayaks. Two of our Tyees are high-volume models, making them even roomier for long-legged people. Before registering on a trip, it is recommended that particularly large people try out a high-volume Seaward Tyee (with a standard-sized cockpit) to ensure that the kayak will fit them. An individual may reserve one of our high-volume Tyees; please contact Gord for details. Very tall people with long legs and large feet are encouraged to carefully consider their kayaking footwear options: Booties with thin, flexible soles will enhance your ability to use the rudder pedals. Kayaking footwear with thick, inflexible soles or with thick padding on heels and toes can make kayaking uncomfortable for very tall people with long legs and large feet. Smaller people are encouraged to consider the option of bringing "volleyball-style" knee pads, as those with shorter legs may find thick kneepads help them to fit into the kayak more comfortably and securely. Sorry, we do not rent our equipment. Our kayaks are provided only to our tour guests and expedition participants. Kayak rentals are available through Moresby Explorers. Our price per person is generally higher than other kayak tour companies on Haida Gwaii. This is partially a result of our small group size; we offer one of the smallest guided kayak tour groups in Gwaii Haanas. Additionally, our trips explore the most remote regions of Gwaii Haanas, which enables us to visit the ancient Haida village of SGang Gwaay, yet makes the included speedboat transport more expensive. Most of our tours and expeditions include accommodation at the Rose Harbour Guest House on the last night of the trip. Our prices also reflect the consistently high quality of our equipment, as well as the many unique experiential and aesthetic characteristics of our trips. For details, please see: Why Choose Butterfly Tours? We offer a few different price-reduction options: Our annual seat sale is held each November and requires full payment in advance. Group discounts may be offered to groups of four or more people who register together and provide full payment in advance. We may occasionally post discount opportunities on social media. Sorry, we do not offer seniors or children discounts. Yes, we welcome independent travelers; there is no singles supplement. (No surcharge is added to the cost per person when traveling alone.) Any number of people up to our maximum group size are welcome to register on our trips. The information provided within this website describes several unique experiential characteristics of our guided tours and expeditions. Detailed information can assist people in making informed decisions, while developing accurate expectations. When guests arrive with accurate expectations, a trip flows smoothly and a delightful sense of group compatibility can quickly occur. It is not always possible for us to cater to an individual's specific food preferences. If you require specific foods, or are unable to eat certain foods, please contact Gord to request more information before registering on a trip. Sometimes, less is more. The remote, southern tip of Gwaii Haanas encourages this perspective. Our kayak tours concentrate in this distant region; an area that highlights the very best of what Gwaii Haanas has to offer. Exploring this remote region allows us to visit the ancient Haida village of SGang Gwaay. The amount of time spent in the ancient village of SGang Gwaay depends largely on the Haida Watchmen that work at the site. Each group that lands on the island generally spends an hour or more in the village with the totem poles. Each trip is different. If another group is not waiting, village time may be extended. We customarily spend several hours on the island, including one hour or more in the ancient village. Waters of SGang Gwaay isSGang Gwaay Adventurer and Waters of SGang Gwaay are suitable for relatively inexperienced paddlers, as well as accomplished kayakers. Cape Freeman and Evolution expeditions are designed for kayakers who have accumulated some experience and developed reasonable boat-handling abilities. Participants are requested to arrive in Sandspit at least one day prior to trip departure. It is often preferable to schedule your arrival two days early, in order to have extra time to deal with the potential for delayed baggage, or missed flight connections. It is generally best to stay in Sandspit the night before your kayak trip, as you are likely to depart early on the first day. 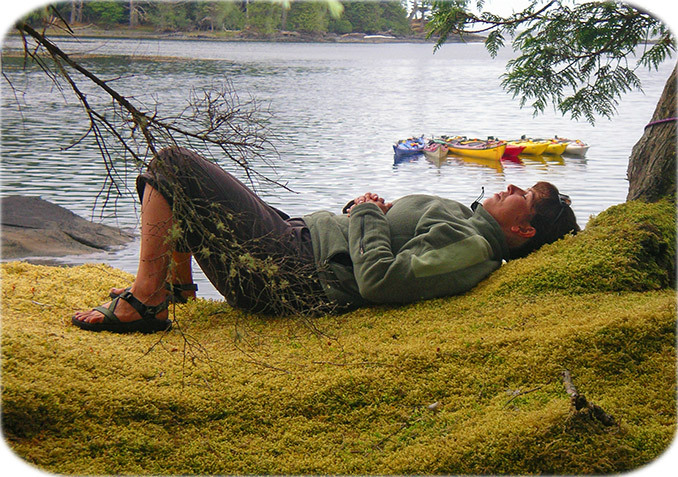 Guests are encouraged to enjoy additional days on Haida Gwaii before and after their kayak trip. There are many additional travel opportunities on Haida Gwaii, including visits to museums, beach hiking, fishing and exploring the Islands' communities. We highly recommend the Haida Heritage Centre - a focal point of Haida culture in Skidegate. For more information, please see the Queen Charlotte Visitor Centre. Seaport Bed & Breakfast will store items for their guests. Most other Sandspit accommodations will also store items. The group generally arrives in Sandspit sometime between 5 and 9 PM on the last day of the kayak trip. Weather and sea conditions can delay the speedboat. On calmer days, the boat takes a more direct and exposed route, often enabling the group to arrive in Sandspit around 5 PM. On windy days, the boat may take a longer, more sheltered route. The boat does a two-way trip, so the longer route results in a later arrival in Rose Harbour, as well as a later arrival back in Sandspit. Participants are requested to make return travel arrangements for the day following the trip, or later. It is generally best to stay in Sandspit the last night of your kayak trip, as you may return late on the last day. Most cell phones work near Seaport B&B in Sandspit. There is no cell phone reception in the wilderness regions we kayak through, or in the remote community of Rose Harbour. Your guide carries a satellite phone for emergency communication during the trip. We have not found a reliable method for accurately predicting when a trip may sell out. Trip reservations have a rhythm of their own and can fill quite suddenly when groups register together. We are flexible and we will do what we can to assist you. It is generally possible to hold space for an hour or two while you make arrangements for your travel to Sandspit. Holding space without a deposit for more than two hours becomes complicated when there are only a few spaces available on a trip. When you are ready to register by paying a deposit, we will accept your reservation unless another person has the space on hold for an hour or two. Yes, international credit card transactions can be completed via PayPal Online Deposits. We also accept Visa, MasterCard & American Express payments by phone for CAD $500 per person deposits. Smokers rarely join our tours. When someone wants to smoke tobacco on a trip, we ask the smoker to ensure no one else will detect the scent. Smokers are requested to walk far downwind before lighting up. Smoking while in the kayaks is discouraged. Additionally, we ask that a portable ashtray is used. Thank you for your consideration. Sorry, no. Pets are not invited on any of our trips. The "Butterfly way" refers to our style of travel. Gord charters Moresby Explorers to provide van and boat transport between Sandspit and Rose Harbour for our tour guests and expedition participants. Guests will require accommodation in Sandspit before and after the kayak trip. We recommend Seaport Bed & Breakfast. Moresby Explorers has owned and operated Seaport B&B since 2010. Recently, the accommodations were completely updated. The Ocean Light II is a beautifully appointed 71’ ketch-rigged sailboat. Our Kayak Mothership Cruise is provided by two companies working in close cooperation. Butterfly Tours and Ocean Light II Adventures combine resources to make this unique journey possible. Rose Harbour resident, Götz Hanisch, hand-built this wilderness guesthouse. Butterfly Tours arranges accommodation at the guesthouse on the last night of our kayak trips. Götz is also a very talented musician.